Katie Feeney (Beauty) and Declan J Gardiner (Prince NIcky). A GALWAY Christmas without the Renmore Panto is as unthinkable as Santa without his sleigh, and this year’s spectacular offering, Sleeping Beauty, opens on December 29 at the Town Hall and runs to January 13. 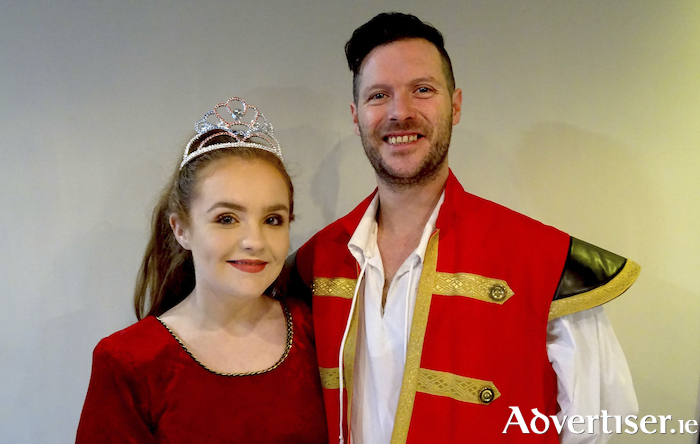 This is the 40th year of the Renmore Panto but it remains as sprightly as ever and once again promises a whole hamper’s worth of festive family fun, with a script by Panto Dame Peter Kennedy, and direction by the AIMS award-winning twins, Brian and Seán Power. Audiences will be sure to relish the Eurovision-themed slant on Sleeping Beauty Kennedy has devised for the production. With Ireland trying to get back to its winning ways in the Eurovision Song Contest, two of Ireland's beloved Eurovision Royalty, King Johnny (Nathan Mannion ) and Queen Linda (Katie Creaven ), marry with the sole intention of creating a genetically perfect Eurovision star of the future. Princess Beauty (Katie Feeney ) is born and the Eurovision hopes of the realm rest on her young shoulders. Uncle Louie (Michael Cooney ), Sir Philip (David Booth ), and Prince Nicky (Declan J Gardiner ) judge the competing hopefuls, which include Jill (Siofra Ní Chonluain ) and Egbert (Michael Healy ) as well as Princess Beauty. Naturally there is a villain to boo and hiss and in this case it is the wicked Queen Diana (Marsha Maly ) who believes the Eurovision crown belongs to her and puts a curse on Beauty to prevent her from ever representing Ireland! With Nanny Annie (Peter Kennedy ), and friends Penny (Eilish O'Malley ) and Dopey Dave (Richard Brown ) by Beauty's side, can they help to break the wicked Queen's curse? Will this tale end happily ever after? So how is she finding the step up from supporting player to lead performer? “It’s really good fun,” she declares. “I knew all the actors who played leads in the past few years and I had my eye on doing it for a while. I wanted to take on the acting side of things as well because I’ve been just been doing the singing and dancing up to now. It’s a really lovely group of people and we all get on very well. Sleeping Beauty runs at the Town Hall Theatre for 21 performances from December 29 to January 13. There will be matinees (2.30pm ) on December 29, 31, and January 1, 5 and 12, and (12 noon and 4.30pm ) on Sundays December 30, and January 6 and 13. It will run nightly (7.30pm ) on December 29, and January 1, 3-5 and 8-12. There will be a special sensory friendly performance on Sunday January 6 at 12 noon to meet the needs of children and adults with autism spectrum disorders and other sensory difficulties. There will be a special gala performance on Saturday 5 at 7.30pm, which will celebrate the cast and crew of the panto of 25 years ago - Cinderella in 1994. For tickets contact the Town Hall (091 - 569777, www.tht.ie ).